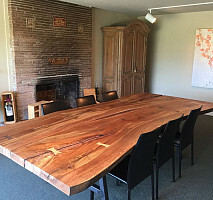 Eli & Jacob Froneberger created Greenport Designs in 2012, to cut down on environmental hardship, while also providing their customers with an exemplary product and catering to any specific style in your home, garden, or business. Their team has a collective 100 years of experience in commercial and residential remodels and build-outs. No matter what the project, they will provide an experienced specialist that can handle the job. The Greenport team prides themselves on clear, honest and timely communication, so you are never in the dark about your project. From electrical, landscaping, custom cabinetry, kitchen/bath remodels to ground-up construction, they can truly handle it all. So glad that we could help out with your new space! Comments: The team was professional<on time, etc. The project took longer than estimated and there was some damage to existing eaves. The replacement was not completely to my satisfaction. Due to weather, etc. and the wrong estimate of time, the project that was to take three day lasted from before Thanksgiving to a few days before Christmas. The work on the house, other than the replacement eave was excellent. Comments: I had a small job which was to repair the leg of a chair that had broken off. I made many phone calls, but everyone I spoke to could care less or would even return my phone call. Until I called Eli at Greenport Designs!! Eli was so courteous and polite and was willing to take a look at my chair and see if it could be repaired. He always answer the phone and was prompt in getting back to me on the status of the chair. Not only did he do a great job of repairing the leg, but Eli personally delivered the chair to my home in just a few days. Eli couldn't have been nicer and more helpful! I will definitely use him on my next job when I redo my bathroom cabinets. Comments: I cannot thank Greenport enough for helping me create the space of my dreams. When I came to Eli and Jay in early 2016, I was discouraged by my family's opinion of building open shelving throughout my kitchen. I wanted a wrap around top shelf and my family disagreed, saying it would close off the space. Eli and Jay met my concerns with a logical approach, further creating a vision I could never see for myself. 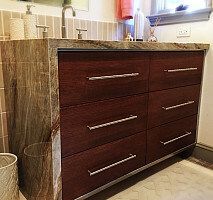 Their enthusiasm for my project fed into every facet of my home and before I knew it I had three custom shelf units made of walnut for my kitchen, a beautiful pine bar-type desk, and a few smaller walnut shelves throughout my home. They kept me updated throughout the process and even invited me to their shop to check out the progress! When I wanted more depth for my desk, Eli had the brilliant idea of using my grandmas redwood scrapings to create a two-tone look that worked beautifully! I've worked with a number of designers, contractors and artisans throughout my life and Greenport has been the best by far. Their work ethic is impeccable, their design unmatched, and their demeanor is personable yet professional. I couldn't have asked for a better experience working with Eli, Jay and their team at Greenport. Thank you, thank you, thank you!! Comments: Eli, Jay and the entire team at Greenport are amazing! They have been helping us with projects for a few years now, so when it came time to renovate our new office space we gave them a call and the end result is nothing short of amazing. We demo'd the space so it was just a shell and they brought our vision to life--we have a beautiful space to work in, and we are proud to show off to clients. They were jacks-of-all-trades and gave us polished concrete floors, a production room, new conference rooms, several individual offices and an open studio (complete with custom desks, shelving, sliding windows in the offices and walnut/glass barn doors). The entire team are an absolute joy to work with! On top of bringing great ideas and a wealth of knowledge to the table, it is obvious that they are passionate and excited about what they do. Eli worked with us through more ideas and designs than I care to admit; and did so with SO MUCH patience! We are so grateful to have been able to work with the team at Greenport Designs! Streel frame waterfall slab bathroom vanity.